How do you comprehend both the majesty and the sacrifice of Jesus? We've been looking at our Lord's identity all this month and still we find ourselves amazed, delighted, bewildered, and blessed by his glorious and humble character. The main thing, however, is that he made peace between a perfect heaven and a flawed humanity. 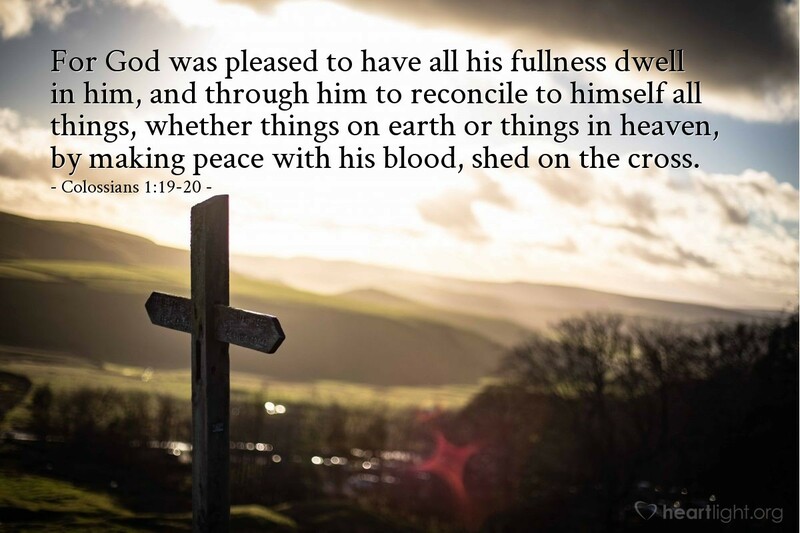 He made this peace at horrific cost, the shedding of his own blood on the torture tree at Calvary. He did this with all of God's pleasure and nature in himself. He did this because of our sin. He did this because of love. O Father, I am sorry that it took such a great sacrifice to atone for my sin. I am thankful that you loved so much that you would pay the price for that sacrifice. I praise you for bridging the distance that I could not cover that my sin created between you and me. May you be as pleased with me today and see my life as a praise for your costly grace. In Jesus' name I thank you. Amen.